Okay, can we just get the song already? Calvin Harris initially teased the track, officially called “Slide,” featuring Frank Ocean a few weeks ago, and now we can confirm FO is on it as well as Migos. I am here for this. Listen to another snippet of the song with some vocals from Migos’ Offset below. Check back for when the song actually drops! Sup, yinz? Last night we FINALLY received new music from Frank Ocean who has been in hiding for the last four years. Well not really in hiding – he was seen drag racing with Tyler, The Creator the other night in LA but musically he has been hiding. Although I wanted to go to bed early last night, I couldn’t resist and just had to watch, yes watch, his new music. I mean, I did stay up quite late for a whole week watching an ENDLESS (supposed) live stream of him building this staircase, so I felt I had to watch immediately. 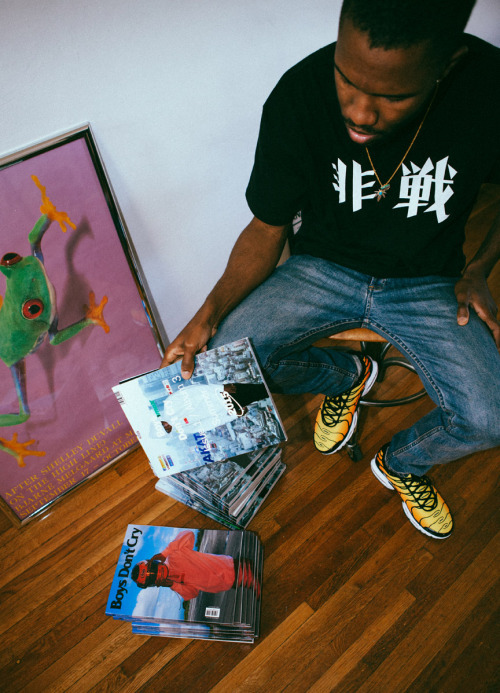 Any who, Frank debuted a visual album titled Endless. Many thought, including myself, the project was going to be called Boys Don’t Cry, but nope. He changed it on us. However, there are rumors and speculations that he will drop another project this weekend that could be titled Boys Don’t Cry. Stay tuned for that one. Anyway, check out my review of the project below! Did you watch Endless? If so, what did you think? Also, does anyone know why he changed the title to Endless or what the staircase is for? I don’t actually know, but maybe it’s a metaphor of some type? An endless staircase? We will be endlessly waiting for a true album from him? So many questions. No real answers. Happy Friday, yinz! And be sure to follow me on Snap to see more reactions, reviews, and ridiculous moments… ergense. Can it be Friday yet? I suggest you tune into my Snap because not only have I been following this all week, but when this ish drops… just saying. And while we wait for Boys Don’t Cry, you can listen to a playlist of all the instrumentals that were featured in the live stream thus far. UPDATE: Apple Music Tweeted just a bit ago a link to the live stream that was originally on Frank’s album site. But now when you click the link, it takes you to the stream on Apple Music. I’m about to share a major key with yinz… GET APPLE MUSIC. Too many (epic) artists are signing deals with the streaming platform, and you don’t want to be the lone listener trying to find the song, album, mixtape, etc. from some janky site. [original post continued here] …and not because of the weekend. And if anyone should be checking the time, it should 100% be Frank. Hello, sir. Where are you? So, it’s been a minute since I’ve posted, and I know I said I was starting a new weekly series, but chill fam, life happens, and I get caught up. Anyways and more importantly, we not only have Travi$ Scott dropping his new album this Friday but now reports are saying Mr. Frank I’veBeenHidingForFourYears Ocean will also be dropping his album. Since this morning, I’ve had Frank’s Boys Don’t Cry site up – still up now – because at midnight on the West Coast he launched this stream. I’m basically trolling myself because I hear the live stream is really just a video loop. But in the small chance Frank pops out and live streams his album, I need to be the first to know and share the info with yinz. So Sara May Cry if he doesn’t actually drop this album on Friday, and if he doesn’t, at least I have Birds in the Trap Sing McKnight to fall back on. Not going to lie though, I’m probably a little more excited for Travy’s album anyway. Definitely stay tuned to this post for more updates. On Monday, April 5, Mr. Ocean finally took to his Tumblr to announce the follow-up album to his 2012 release ‘Channel Orange.’ This has been a long time coming – the man was MIA for about a year. The long-awaited album, plus a supposed magazine, are set to drop in July (insert praise emoji). The publication will be titled ‘Boys Don’t Cry’ – it should be called ‘Kylie Don’t Cry’ – I know how excited you are for this. The album has yet to be titled. I made sure I was fully awake at 7:15am sharp on Monday morning to hear the official lineup for Power 106’s annual summer concert, Powerhouse. Getting more and more excited as each artist was announced, it wasn’t until the end that they brought out the big dog… Mr. Kanye West. The rest of the lineup includes: Ty Dolla $ign, Ludacris, Tinashe, G-Eazy, Nipsey Hu$$le, Kid Ink, Casey Veggies, Logic, B.o.B. and Tech N9ne. Pre-sale tickets went on sale Wednesday morning – obviously I snagged a pair (can’t wait, Parker!). I must say, I’m pretty amped to see Luda perform, as well. Powerhouse takes place on Saturday, May 16 at the Honda Center in Anaheim. This I just want you to watch because Kendrick is epic, LA is epic, and these Reeboks are about to be epic.